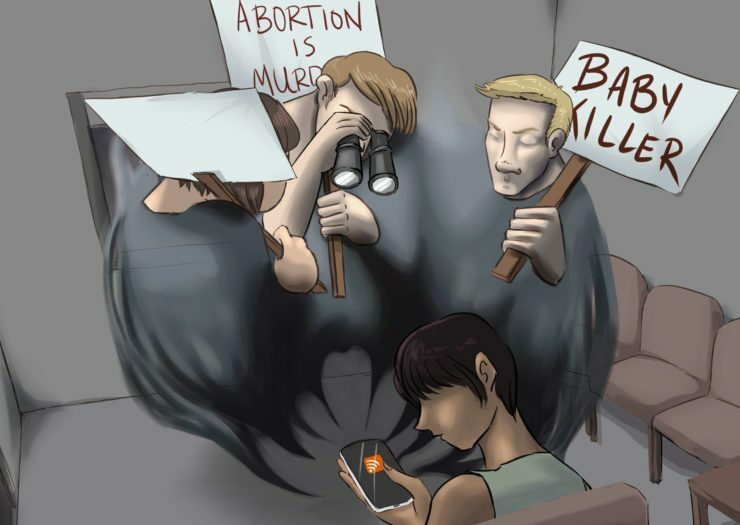 Geo-fencing technology can be deployed by anti-choice groups to send propaganda directly to a woman’s phone while she is in a clinic waiting room. Last year, an enterprising advertising executive based in Boston, Massachusetts, had an idea: Instead of using his sophisticated mobile surveillance techniques to figure out which consumers might be interested in buying shoes, cars, or any of the other products typically advertised online, what if he used the same technology to figure out which women were potentially contemplating abortion, and send them ads on behalf of anti-choice organizations? Before long, he’d been hired by RealOptions, a network of crisis pregnancy centers (CPCs) in Northern California, as well as by the evangelical adoption agency Bethany Christian Services. Flynn’s endeavors quickly won him attention in the anti-choice world. He was invited to speak at the Family Research Council’s ProLifeCon Digital Action Summit in January this year, and he got a few write-ups in anti-choice press. In an interview with Live Action News—the website for Live Action, the group run by anti-choice activist Lila Rose that is responsible for bogus attack videos against Planned Parenthood—Flynn gave some details about his strategy. He sends advertisements for his clients to women’s smartphones while they are sitting in Planned Parenthood clinics, using a technology known as “mobile geo-fencing.” He also planned to ping women at methadone clinics and other abortion facilities. His program for Bethany covered five cities: Columbus, Ohio; Pittsburgh, Pennsylvania; Richmond, Virginia; St. Louis, Missouri; and New York City. “We are very excited to bring our mobile marketing capabilities to the pro-life community,” Flynn told Live Action News. Anti-choice groups were tantalized by the ability to home in on the women they think will be most susceptible to their message. Flynn’s targeting of women seeking abortion presents a serious threat to the privacy and safety of women exercising their right to choose, as well as to abortion providers and their staff, a Rewire investigation has found. But due to weak and patchwork laws governing privacy and data collection in the United States, the conduct appears to be perfectly legal. Women who have visited almost any abortion clinic in the United States have seen anti-choice protesters outside, wielding placards and chanting abuse. This technology, when deployed by anti-choice groups, allows them to send propaganda directly to a woman’s phone while she is in a clinic waiting room. It also has the capability to hand the names and addresses of women seeking abortion care, and those who provide it, over to anti-choice groups. “It is incredibly unethical and creepy,” Brian Solis, a digital marketing expert, told Rewire, expressing a view that was unanimous among a dozen experts in digital security, privacy law, and online marketing we interviewed for this story. Solis said this example was the inevitable application of a technology meant for one purpose—mass advertising campaigns that, while considered by many people to be unseemly and intrusive, do not generally amount to a threat—to a very different, and troubling, objective. By now, most Americans have experienced the following phenomenon: You look at something online—a hotel, a flower delivery service, a course at a local college—and the next thing you know, ads for that thing follow you around the internet for the next week. This is all part of the new landscape of digital advertising, where marketers can tailor their ads to very specific groups of consumers by compiling “personas” based on the thousands of shards of data we all create as we go about our activities online. While theoretically anonymous, these marketing personas are surprisingly accurate. Marketers likely know your age, gender, occupation, education level, marital status, and—if you have GPS enabled on your phone and are logged into apps that track you—where you live, work, and travel. What Flynn realized is that he could use the same technologies to infer that a woman might be seeking an abortion, and to target her for ads from anti-choice groups. In his sales PowerPoint, Flynn said that he had already attempted to ping cellphones for RealOptions and Bethany nearly three million times, and had been able to steer thousands of women to their websites. The price tag for one of Copley’s campaigns, he said, was $8,000. Flynn initially agreed to speak with Rewire for this story, but did not respond to multiple follow-up emails and phone calls. Much of this report is based on materials that he sent to people he believed to be potential clients. Numerous messages seeking comment from management for RealOptions went unanswered; Jennifer Gradnigo, a spokesperson for Bethany Christian Services, confirmed that they have used Copley’s services and “appreciate their ideas,” but declined to discuss specific campaigns. Not everyone who received Flynn’s pitch emails was impressed. One recipient contacted Rewire after speaking with Flynn, and expressed horror at what Flynn told her he was able to do on behalf of anti-choice clients. “I felt disgust, and I felt protective of these women who are going to seek sensitive medical services at a time when they’re vulnerable,” said the recipient, who is a social worker at a Northern California adoption agency. Rewire agreed to withhold her identity due to her fears of retaliation from anti-choice activists. In emails and PowerPoint presentations sent in early March, Flynn claimed to have reached more than 800,000 18-to-24-year-old women on behalf of RealOptions, and to have sent more than 2,000 of those women to RealOption’s website. Rewire obtained three examples of the ads that Flynn said he had sent to young women’s phones on RealOptions’ behalf. The ads are typical of CPCs. Bethany is the nation’s largest adoption agency, with assets of more than $45 million in 2014, according to the most recent available figures. The chain has faced accusations of pressuring birth moms to continue pregnancies against their will, of abandoning mothers who change their minds and decide not to go through with adoptions, and other abuses. The social worker who received Flynn’s pitch deck told Rewire she was alarmed that Flynn had succeeded in reaching so many women on behalf of his anti-choice clients. Although it is now ubiquitous, mobile digital advertising is a relatively new phenomenon, only as old as the sophisticated smartphones on which it relies. As a result, laws and the regulators who enforce them are lagging behind when it comes to the many possible ways that bad actors can abuse smartphone advertising. The other limitations, such as they are, come from two sets of laws. The Federal Trade Commission (FTC) and state attorneys general can prevent advertisers from sending false and misleading ads; they can also stop advertisers from lying about what information they are tracking and what they plan to do with it once collected. The FTC did not reply to Rewire’s questions in time for the publication of this story. However, the commission does not have jurisdiction over nonprofits, so it is highly unlikely that it could take action in this case. The second set of laws concern user consent. Companies like Verizon and AT&T, known as carriers, are required to get affirmative consent before using “Customer Proprietary Network Information” gleaned through cellphone towers—including call records and location—for marketing. Apps don’t use network information, but rely instead on the GPS built into phones. They also need to obtain affirmative consent to collect and use information for marketing. Obtaining that consent is easier than many consumers may think. Certainly, most people wouldn’t imagine that by agreeing that, say, Yelp, Snapchat, Tinder, or the New York Times could use their location, that marketers could then use the same information for the very different purpose of figuring out whether they are seeking sensitive medical services. Hoofnagle says that such use is perfectly legal, as long as companies don’t lie about what information they’re collecting—even if those disclosures are buried in fine print. For his part, John Flynn is confident that his campaign is within legal bounds. In the absence of robust legal limitations in the United States, advertisers have organized into self-regulatory bodies to police themselves, acutely conscious that examples of egregious privacy violations could spark a public backlash, and lead consumers to block ads and to opt out of targeted marketing. A key pillar of DMA’s work is to ensure that data-driven marketers conduct their work on an ethical basis, respecting the private information of consumers. This is particularly true for sensitive medical information about particular individuals, the use of which for marketing purposes without permission is against DMA’s Ethical Guidelines. Any location-based marketing should be opt-in, with the consumer notified that marketing offers are being presented due to their location. Hutter did not provide a direct reply to our questions as to whether targeting women who might be seeking abortion care on behalf of anti-choice groups would be in violation of DMA’s guidelines. It would, however, violate Facebook’s standards, according to Tom Channick, a company spokesperson. Flynn claims that he has a “relationship” with Facebook that allows him to “place mobile and digital ads in Facebook pages,” but Channick said the company could find no record of Flynn or his company ever using their platform. Calling Flynn’s campaigns “really objectionable,” Hoofnagle said that these kinds of practices are toxic to the digital advertising industry, as well as the platforms—like Google and Facebook—that depend on advertising dollars. He said this example drives home the fact that the nature of advertising has fundamentally transformed with the rise of the internet, and as smartphones have become ubiquitous. Surveillance has long played a central—and deadly—role in the efforts of anti-choice activists to intimidate women out of accessing abortion care, and to stop providers from making it available. In the late 1990s, an anti-choice extremist created a website called the Nuremberg Files—in reference to Nazi Germany—which was a list of the names and addresses of doctors who provided abortions. Operation Rescue maintained a site called “Tiller Watch” that monitored the doctor’s whereabouts until he was murdered in the spring of 2009. Extremists have published “Wanted” signs with photographs of abortion providers. Activists in Texas stalk people entering local clinics, noting their physical appearance and license plates, hoping to determine which women went through with their abortion and whether anyone changed their mind, as well as to identify clinic workers. Many providers around the country report having been followed on their way to and from work. Sasha Bruce, senior vice president of campaigns and strategy at NARAL Pro-Choice America, says that tagging the cellphones of women who go to abortion clinics falls within the pattern of intimidation. Bruce said she was alarmed in particular because Flynn was not just collecting information about what women looked at online, but also about their physical locations. To be clear, there is no evidence to suggest that Flynn or his clients have or want to use geo-fencing to learn the real identities of women seeking abortion. But experts told Rewire that the potential for others to abuse the technology is a cause for alarm. In keeping with the view that transparency fosters security, Rewire has chosen to outline the ways this tracking could be misused. In theory, when marketers gather information about individual smartphone users through methods like geo-location, that data is anonymized, meaning that it is not attached to a person’s name, but rather to a unique number known as an “advertising ID.” That is the number associated with the particular copy of the operating system that each of us has downloaded onto our smartphone. If you use a Google phone, your operating system is Android; for iPhone users, it’s your copy of iOS. Much of what you do on your phone can be associated with that advertising ID. In most cases, marketers want to collect data from millions of potential customers, said John Deighton, a professor of marketing at Harvard Business School, in an interview with Rewire. The more data they have, the more ads they can send, which enhances their database. “What your story is drawing to my attention is that these same surveillance technologies can be used at a much more micro scale,” he said. “You could imagine outright illegal use of geo-targeting: for example, geo-targeting a rich person’s house and getting an alert when they leave home.” That could, say, lead to high-tech burglary. “Once you start realizing you can target desirable individuals, instead of being a big data function it becomes about tiny data,” Deighton said. But if all of the data that marketers collect is supposed to be anonymized, how could bad actors—including anti-choice extremists—figure out the actual identities of the people they track? The dirty secret of digital marketing is that it is in fact relatively easy to find out the real identities that are attached to our online IDs, according to experts who spoke with Rewire. The most obvious way is simply to ask people for that information. Both RealOptions and Bethany Christian Services require a person’s name and contact information in order to receive information online. Once a woman enters her name, email, home address, phone number, or ZIP code, that information is tied to her advertising ID, and Flynn could potentially marry that ID to all data associated with it and store it in what he calls his databank. There are, however, plenty of less aboveboard methods to learn the name attached to an anonymous ID. Any site or app that uses a profile with your name and any other information—Facebook, dating services, banking apps—can link your device, and your advertising ID, to the real you. Legitimate services would not hand over personally identifying information willingly, but there are many instances of such information being made widely available. The cyber attack on Ashley Madison, the dating site for married people seeking extramarital partners, resulted in the release by hackers of the personal information of 32 million of the site’s users, revealing the potential for profile-based sites to be targeted. Even without sophisticated hacks on established sites, bad actors can use techniques known as “social engineering” to learn the personal identities associated with advertising IDs. For instance, if an anti-choice group wanted to learn the identity of women seeking abortions, instead of sending them ads for CPCs, they could send ads that seemed unrelated to abortion—for a competition to win $500, or for help with student loans—that tricked women into entering their names, email addresses, and any other information required by the form. Any woman who filled out the form would have unwittingly handed her name to anti-choice activists. That would allow anti-choice groups to literally see women’s whereabouts in real time, said digital marketing experts who spoke with Rewire anonymously because they were not authorized to speak with the press. They described marketing software that allows them to see targeted individuals’ locations, the same way you can see yourself as a blue dot on a smartphone map. If certain people were seen at an abortion clinic regularly—say, during work hours—Flynn or his clients might even be able to infer that they work there. The question naturally arises: What can abortion providers and the women they serve do to fend off these digital affronts? The simplest measure Planned Parenthood, or any other abortion provider, could take is to tell patients to leave their smartphones at home or in the car. If that isn’t possible or practical, the best advice is to turn off their GPS and log out of all apps before they come to a clinic. It’s a simple step, but one that many people either won’t or don’t take, said Cooper Quintin, a technologist at the Electronic Frontier Foundation (EFF), a San Francisco-based organization dedicated to preserving fundamental rights in the age of technology. “The way we need to fight back against this is by blocking these things that are tracking who we are and where we are and what things we’re looking at,” Quintin told Rewire. EFF considers location-based tracking to be a serious threat to privacy. Editor’s Note: Watch our video for info on how to avoid location-based tracking.